Over the past few weeks I’ve mentioned (in passing) the ability to buy additional Series I Savings Bonds with your tax refund. 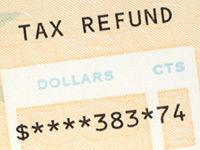 In short, you can request up to $5k in I-Bonds (in $50 increments) with your tax refund. These are issued in paper form and are in addition to the $10k annual (electronic) purchase limit. You could adjust your withholding in an attempt to create the necessary overage. But that’s somewhat imprecise and it also means that you’ll be giving the IRS an interest free loan for longer than necessary. Instead, I suggest one of two things. Either figure up your tax liability (or a reasonable estimate) early enough to make an estimated tax payment or request an extension along with a payment large enough to create a $5k refund. We did the latter last year, in part because we didn’t get our taxes done until the last minute. Thus, we didn’t have time for the estimated payment to clear. This year we have our taxes done in plenty of time, so I’m planning on making an estimated payment to create the overage. Once that payment clears, we’ll file our return and claim the refund — complete with our extra I-Bonds. Yes, we’re past the due date for Q4 estimated payments, but they’ll still accept the payment and credit it to our account. Thus, it’s still not too late to pull this off and snag our extra savings bonds without requesting an extension. You’re limited to a $5k total I-Bond request even with a joint return. You can request your I-Bonds on Form 8888. You can request an extension with Form 4868. If you request an extension, you have until Oct 15th to file your return. All in all, this is an easy process. Well worth it if you want the extra I-Bonds. When Will My Income Tax Refund Arrive? This option for investing my tax refund is appealing to me. I’m a bit weary of the ongoing serial financial crises in D.C. and on Wall Street. Tiresome, and risky. I never realized they were in addition to the limit. That could be useful for some investors. Thanks for sharing! I just did this using TaxAct. It was a piece of cake to figure up my taxes, see how much of an overpayment I needed to make, and then e-file the Form 4868 extension request along with the overpayment amount. Two business days later, the overpayment was deducted from my bank account via ACH and I then proceeded to e-file the final Form 1040 and Form 8888 requesting $5000 in I Bonds. Three business days after that, the IRS “Where’s My Refund” web site indicates my return has been accepted and the refund approved. I should receive the bonds within 3 weeks by mail. Adam: Great, glad it was so easy for you. Well worth the minimal hassle, huh? Next post: Stock Splits: What's the Deal?